Bee-Keeping since 1980, Bee-Breeding since 1998 (according to Brother Adam), also international shipping of queens. Self reared queens from registered and quality tested resp. selected Breeder-Queens. These valuable queens make soft, no resp. 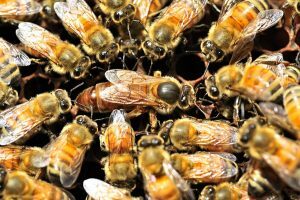 low swarming, vital, strong breeding and high yield colonies – for honey of best quality. The Buckfast-Bee was the life´s work of Brother Adam (1898 – 1996) from the Benedectine Abbey Buckfast. Since 1998 I myself breed Buckfast-Queens. My breeding mothers are bred by insemination, island mating or protected mating place. The progenies are gained from the best mothers. Every year Beekeepers order my queens also multiple from abroad: besides England, France, Spain, Austria, Netherlands and Turkey meanwhile also from Lithuania, Latvia, Poland, Russia, Ukraine, Jordan, Israel and so on. Member of Landesverband Niedersächsischer Buckfastimker e.V. and of Gemeinschaft der Europäischen Buckfastimker e.V.. Inquiries and also orders of our high-quality honey, best propolis and handmade bee wax candles could be done online by contact, by phone +49-551-980 99 68 or ask for Skype-Contact, please. on Thursdays at the farmer´s market in Göttingen from 8 am to 1 pm.